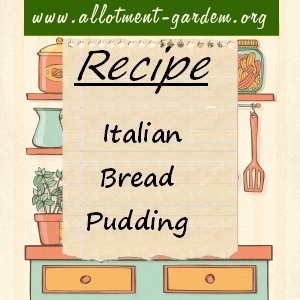 This is a really easy to make Italian twist on the bread pudding. Arrange the apple rings in the base of the dish, sprinkle half the sugar over the apples, at this point you can add dried fruit. Pour the wine over the fruit, add the slices of bread, pushing them down with your hands to flatten them slightly. Mix the cream with the eggs, the remaining sugar and the orange rind and pour the mixture over the bread, leave to soak for 30 mins. Serve warm with cream. For a skinny option you can use creme fraiche.